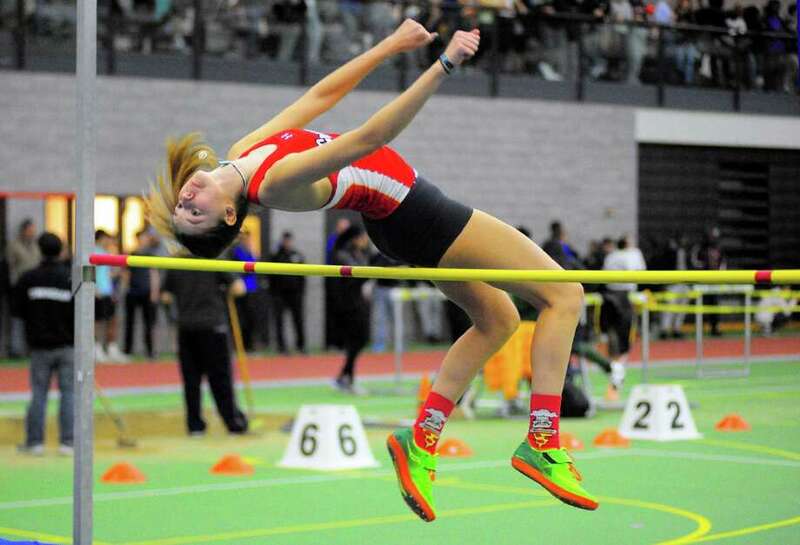 Greenwich's McCallum Harkins competes in the high jump during FCIAC Track Championship action in New Haven, Conn., on Thursday Jan. 31, 2019. Danbury finished the evening with five first-place finishes to go with a ton of points from top-six finishes. The Hatters amassed 110 points on their way to victory. Ridgefield won the final event, the 4×400 relay, to take second place with 60.50 points. Ludlowe (57) was third, followed by Greenwich (54.5) and Trumbull (46). McMahon (30), Wilton (24), Darien (20.5), New Canaan (19), St. Joseph (18.5) and Norwalk (16) were next. In the 4×200 meter relay, the McMahon quartet of Niamh Linehan, Savannah Bromley, Chloe Ortolano and Peyton McNamara won in 1:49.08. Greenwich (1:49.67) was runner-up with Ludlowe (1:51.44) third. In the 4×800 meter relay, the Trumbull foursome of Kali Holden, Carolyn Cardell, Alessandra Zaffina and Emily Alexandru won in 9:50.25. Ridgefield (9:50.91) was second with Greenwich (10:05.16) in third. In the pole vault, Ludlowe High senior Laurel Blackman was champion as she cleared a personal best and school-record height of 9-feet-6. Wilton’s Anna Rava and Trumbull’s Aleksandra Misiewicz tied for second at 9-feet-0. In the 1,000, Danbury senior and future Sacred Heart University runner Cassandra Sturdevant won in 3:05.90. Greenwich’s Zoe Harris (3:06.06) was runner-up. Danbury sophomore Daniella Gruillon-Pena was third (3:07.17). In the 600, Trumbull junior Emily Alexandru won in 1:40.63. Norwalk senior Laura Turner (1:41.10) was second. Ridgefield sophomore Grace Michalowski (1:41.16) took third. In the 55 meter hurdles final, Ludlowe sophomore Tess Stapleton was crowned champion in 8.32 seconds. St. Joseph’s Kayla Clark (8.51) was runner-up. Wilton’s Shelby Dejana (8.63) took third. In the 55-meter dash final, Ludlowe senior Maya Mocarski won in 7.39 seconds. Danbury senior Shanell Stewart (7.45) was second. Wilton sophomore Shelby Dejana (7.48) took third. In the 1,600, McMahon sophomore Amanda Graham won in 5:41.95. Trumbull junior Sabrina Orazietti (5:44.84) was runner-up. New Canaan freshman Kiera Hynes (5:44.90) took third. In the shot put, Danbury senior Celia Ann Chikezie won with a heave of 31-feet-6. Staples sophomore Taylor Symonette (31-feet-2) was runner-up. New Canaan’s Naomi Cimino (31-1.75) was third for the second straight year. In the high jump, St. Joseph sophomore Nia Christie won by clearing 5-feet-2. Ludlowe’s Tess Stapleton (5-feet-2, more misses) was second. Tied for third at 5-feet-0 were McMahon senior Savannah Bromley and Danbury sophomore Chelsi Chevannes. After 10 of the 15 events, Danbury rebounded from as slow start to lead with 66 points. Ludlowe was second at 46 points followed by Ridgefield (32.5) and Trumbull (32). In the 1,600 Sprint Medley relay, the Danbury High quartet of Emily Souza, Shanell Stewart, Jessica Glowacki and Maya Gawley won in 4:28.62. Ridgefield (4:31.39) nipped Greenwich (4:31.42) for second place. In the long jump, Danbury junior Meilee Kry gave the Hatters 10 big points with a winning leap of 17-feet-9.25. Ludlowe’s Tess Stapleton was runner-up at 17-feet-9. McMahon’s Peyton McNamara (17-5) was third. In the 300 meters, Greenwich High senior Jordan Numme repeated as FCIAC champion in 43.07 seconds. Norwalk senior Laura Turner (43.29) was runner-up. McMahon senior Savannah Bromley (43.35) took third. In the 3,200, Danbury sophomore Daniella Grullon-Pena won at the wire in 11:32.31, nipping Ridgefield’s Tess Pisanelli (11:32.61). Trumbull freshman Kali Holden (11:36.61) was third. In the closing 4×400 relay, Ridgefield closed in the final meters to win in 4:11.91 thanks to the efforts of Natasha Riek, Katherine Langis, Carolyn Donovan and Grace Michalowski. Greenwich (4:12.32) was second. Darien (4:20.04) was third. 1. Danbury 110, 2. Ridgefield 60.5, 3. Ludlowe 57, 4. Greenwich 54.5, 5. Trumbull 46, 6. McMahon 30, 7. Wilton 24, 8. Darien 20.5, 9. New Canaan 19, 10. St. Joseph 18.5, 11. Norwalk 16, 12. Staples 8, 13. Stamford 1. 4×200 relay: 1. McMahon (Niamh Linehan, Savannah Bromley, Chloe Ortolano, Peyton McNamara) 1:50.23; 2. Greenwich (Jada Williams, Jordan Numme, Katherine Large, Cameron Castelli) 1:48.03; 3. Ludlowe (Maya Mocarski, Ashley Moynahan, Kayla Pattison, Molly Ferullo) 1:49.67; 4. Ridgefield (Catherine Conroy, Carrina Dabroi, Carolyn Donovan, Natasha Riek) 1:50.88; 5. Wilton (Claudia Nanez, Maureen Campbell, Cassidy Costello, Shelby Dejana) 1:51.67; 6. Stamford (Mya McLeod, Nadia Philogene, Ester Thomas, Ajhane Young) 1:57.64. 4×800 relay: 1. Trumbull (Kali Holden, Carolyn Cardell, Alessandra Zaffina, Emily Alexandru) 9:50.25; 2. Ridgefield (Rory McGrath, Elizabeth Jasminski, Katherine Langis, Grace Michalowski) 9:50.91; 3. Greenwich (Bailey Gordon, Mari Noble, Caroline Webb, Grace Collier) 10:05.16; 4. Danbury (Maya Gawley, Valerie Fox, Vivian Mendez, Caroline Williams) 10:05.46; 5. New Canaan (Celia Sokolowski, Sophie Curcio, Molly Murphy, Ella Gibb) 10:09.53; 6. McMahon (Riley Stenger, Amanda Graham, Tess Jordan, Cassidy Nash) 10:09.84. 55 hurdles: 1. Tess Stapleton (Ludlowe) 8.32; 2. Kayla Clark (St. Joseph) 8.51; 2. Shelby Dejana (Wilton) 8.63; 4. Jaylyn Carter (Danbury) 9.36; 5. Mikayla DePina (Trumbull) 9.48; 6. Elizabeth DeMassa (Ridgefield) 9.52. 55 dash: 1. Maya Mocarski (Ludlowe) 7.39; 2. Shanell Stewart (Danbury) 7.45; 3. Shelby Dejana (Wilton) 7.48; 4. Elizabeth St. George (New Canaan) 7.49; 5. Abbygail Michel (Trumbull) 7.55; 6. Claudia Nanez (Wilton) 7.56. 1000: 1. Cassandra Sturdevant (Danbury) 3:05.90; 2. Zoe Harris (Greenwich) 3:06.06; 3. Daniella Grullon-Pena (Danbury) 3:07.17; 4. Tess Pisanelli (Ridgefield) 3:08.44; 5. Sophie Curcio (New Canaan) 3:11.92; 6. Madeline Ruggerio (Ludlowe) 3:12.84. 600: 1. Emily Alexandru (Trumbull) 1:40.63; 2. Laura Turner (Norwalk) 1:41.10; 3. Grace Michalowski (Ridgefield) 1:41.16; 4. Meilee Kry (Danbury) 1:43.63; 5. Kasey McGerald (Ridgefield) 1:44.25; 6. Evelyn Marchand (Trumbull) 1:44.47. 1600: 1. Lauren Moore (Danbury) 5:13.57; 2. Mari Noble (Greenwich) 5:15.12; 3. Gabriella Viggiano (Ridgefield) 5:16.48; 4. Mairead Clas (Darien) 5:17.25; 5. Stephanie Quieroz (Danbury) 5:17.68; 6. Daphne Cutler (Darien) 5:24.73. 1600 sprint medley: 1. Danbury (Emily Souza, Shanell Stewart, Jessica Glowacki, Maya Gawley) 4:28.62; 2. Ridgefield (Catherine Conroy, Emma Langis, Carolyn Donovan, Caitlin Slaminko) 4:31.39; 3. Greenwich (Alexa Brust, Brett Edmonds, Katherine Large, Zoe Harris) 4:31.42; 4. Trumbull (Jeah Riodin, Abbygail Michel, Ella Consla, Margaret LoSchiavo) 4:35.65; 5. Ludlowe (Ashley Moynahan, Kayla Pattison, Grace Shah, Madeline Ruggerio) 4:37.05; 6. Darien (Kate Armstrong, Brianna Lyons, Katie Chandler, Cameron Appelby) 4:41.71. 300: 1. Jordan Numme (Greenwich) 43.07; 2. Laura Turner (Norwalk) 43.29; 3. Savannah Bromley (McMahon) 43.35; 4. Emily Alexandru (Trumbull) 43.72; 5. Claudia Nanez (Wilton) 43.77; 6. Molly Ferullo (Ludlowe) 43.95. 3200: 1. Sophie Curcio (New Canaan) 12:13.12; 2. Eadaoin Clarke (Greenwich) 12:17.77; 3. Julia Antonicelli (Ludlowe) 12:21.77; 4. Emily Nolan (Ludlowe) 12:22.10; 5. Lauren Doherty (New Canaan) 12:26.46; 6. Juliette Lipson (Stamford) 12:27.53. Long jump: 1. Meilee Kry (Danbury) 17-9.25; 2. Tess Stapleton (Ludlowe) 17-9; 3. Peyton McNamara (McMahon) 17-5; 4. Giuliana Robles (Danbury) 17-2.25; 5. Chelsi Chevannes (Darien) 16-8.75; 6. Emilly Souza (Danbury) 16-4.75. Shot put: 1. Celia-Ann Chikezie (Danbury) 31-6; 2. Taylor Symonette (Staples) 31-2; 3. Naomi Cimino (New Canaan) 31-1.75; 4. Margaux Brennan (New Canaan) 29-10.25; 5. Alexis Chikezie (Danbury) 29-7.75; 6. Caitlyn Filloramo (Ludlowe) 29-5.5. Pole vault: 1. Laurel Blackman (Ludlowe) 9-6; 2. (tie) Anna Rava (Wilton) and Aleksandra Misiewicz (Trumbull) 9-0; 4. Maria DeSouza (Danbury) 8-9; 5. (tie) Ashley Hagander (Darien) and Sophie Reale (Ridgefield) 7-6. High jump: 1. Nia Christie (St. Joseph) 5-2; 2. Tess Stapleton (Ludlowe) J5-2; 3. (tie) Savanah Bromley (McMahon) and Chelsi Chevannes (Darien) 5-0; 5. Maria DeSouza (Danbury) J5-0; 6. McCallum Harkins (Greenwich) 4-10.